Usually I'm pretty good at math, but in this case it took me awhile to put two and two together. Awhile ago, our Childrens Department put a digital picture frame on their desk, using it to display photos of their various programs*. I'd seen and heard of other libraries using digital picture frame like this, and for in-building informational signs (like upcoming events), but I never thought of an application for it at the Reference Desk. Until a couple weeks ago, when I was in the Apple Store in Boston. I'm not at all an Apple fanboy, but I admit that once in awhile, they come up with a good idea. A friend of mine was having trouble with her Mac laptop, so we took it to the genius bar to having someone help us with it. 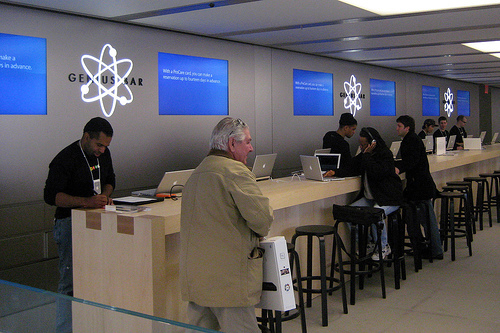 I still really like the idea of the genius bar in and of itself, but what got my attention was that, behind the genius bar were great big screens scrolling through tips and information. The messages were all about using or fixing Apple products, which were perfectly targeted at the captive audience of people waiting for the genius bar. Really, good topics are anything that might be interesting to someone waiting in line at the Reference Desk. The "photos" will just be slides created in PowerPoint, and hopefully, having something interesting to look will give patrons waiting in line something to do (in addition to teaching them something they may not have known). I bet other libraries have already thought of this, so if you're doing it, please comment with how it's working. When I get ours up and running, I'll post an update with how it went. *They decided to use a digital picture frame rather than flickr or other online service, because they were reluctant to post photos of kids on the internet. Keeping the photos offline and in the Childrens Room was a good compromise (between online or not at all), and it might be more likely for the kids to see themselves, too. Sometimes, being a librarian equates to being a packrat. At least in the virtual world, I can collect as many links as I want and it doesn't take up any room. However, to be useful, it does take organization. For awhile now I've been bookmarking posts about free resources for clipart, photographs and other artwork. I use them for library publications, and also for my posts here. But just this week I got my act together and started transferring those links from my Bloglines account to my Delicious account, and thought I'd share them. If you're curious how to do this with Delicious, check out my how-two post for creating library subject guides. The library in my hometown has a blog, which I read because it's well done and because it's a way for me to stay connected with where my family lives. I particularly enjoyed one recent post. Someone found a photo in the library's historical archive that had been later doctored for use in a promotional book. Check the original post for bigger photos. It is interesting to see how the photo, circa 1900, could be altered so well - as opposed to some of the bad work being done now with Photoshop. This shows that fun can come from library archive, especially photo archives. Also, too, the subject of the photo is interesting. It's the dock of Cedar Point, an amusement park in Sandusky, OH. And I am always amazed at how dressing nicely was just a matter of course in that era. People at Cedar Point don't dress like that anymore.